Bed bugs arrived in the United States with the colonists who first inhabited this great nation, according to the National Pest Management Association (NPMA). Since that time, their prevalence has surged and waned. For instance, in the 1950s, high-tech advances, such as washers and dryers and vacuums, reduced their numbers. But by 2000, bed bugs were back in a big way — and they’ve been a growing source of revenue for pest management professionals (PMPs) since. Indeed, about three-fourths of the PMPs surveyed for Pest Management Professional’s (PMP’s) exclusive 2018 Bed Bug Management Survey report the number of bed bug jobs in 2017 rose compared with the number of jobs in 2016. Nearly as many survey respondents expect revenue from bed bug control jobs to increase in 2018. Working with customers can be a challenge. Some don’t comply with pre-treatment preparation instructions. Others continue behaviors — knowingly or unknowingly picking up infested furniture, associating with others who have infestations, etc. — that undermine treatment efforts. 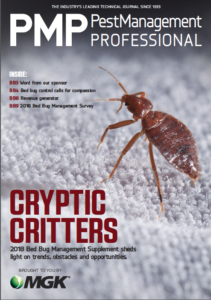 A whopping 78 percent of responding PMPs report having walked away from a bed bug job because a customer would not comply with preparation instructions. To effectively combat bed bugs, PMPs need customers to properly prepare for treatment. Cooperation does not always come easy, however. So it’s no surprise that one-third of survey respondents say they believe most lawsuits and claims related to bed bugs are the fault of uncooperative residents of infested dwellings. Slightly more than half of the PMPs asked maintain they are somewhat concerned about bed bug litigation. Yet only 22 percent of survey respondents hired an attorney with pest management knowledge to help their companies create a bed bug-specific service contract. PMPs have reason to be concerned. A lawsuit filed by a lingerie model against a hotel was just one of many bed bug cases to make headlines recently. She alleges the hotel in which she stayed had bed bugs that left marks on her body so severe she was unable to work. Her lawsuit, which is pending, also alleges she suffered emotionally, experiencing embarrassment and shame. The hotel defended itself, stating a pest control company immediately inspected the room in which she stayed and found no evidence of bed bugs or any other pests. Plenty of tools are available to PMPs who battle bed bugs. The overwhelming majority of those asked rely on pesticides. Effective bed bug management may lead to additional general pest control business and solid referrals. Keeping up with the latest treatment options and communicating with customers is critical. Thorough inspections and follow-up service calls that lead to successful treatments can boost your company’s reputation, too.